For the happy revellers of the Beyond The Tracks festival who are seeking more to finish off the night (be it Friday or Saturday), there are a number of opportunities to party harder and get more ‘bang’ for a buck (or ten). Inviting us to ‘regenerate’ after Beyond The Tracks’ space cadet Friday night, the Oscillate Sound System take over Centrala for an unofficial after party on 15th September – the fledgling festival’s opening day. So, Oscillate..? By this point you’re either as unfazed as you were at word one, or you’re skipping down a serotonin sapped memory lane trying not to think of that song by Biosphere. La, la, la, the 90’s were a simple clubland love in with no scars… I don’t want to know what dream you had last night. But if you need a helpful reminder (either way) Oscillate brought Orbital to Birmingham. So there’s that. And through their bi-weekly club nights at Bonds (as well as a few jaunts to the Dance Factory, Moseley Dance Club, some big-house-in-a-field-somewhere-in-I-think-maybe-Wales, and a disused gas container in Amsterdam) the Oscillate Sound System introduced a further litany of ambient/techno to the second city’s clubbers: Autechre, The Orb, Banco di Gia, Children of the Bong, Sun Electric, The Drum Club, APL, APL, did I mention APL..? I think they even booked Richard James a couple of times, not that that guarantees anything but God loves a trier. It’s fair to say (and it’s been said by more than I) that Oscillate helped shape the dance music landscape of Birmingham in the 90’s, and left its left-of-centre fingerprints on the city’s club scene for some time to follow. You could argue that if they hadn’t someone else would have, but Scylla Magda and Bobby Bird were the ones that did – earning a dance music debt of gratitude that stands up over twenty years later. Plus half of the head honchos at Oscillate are half of the head honchos in Higher Intelligence Agency (Bobby Bird) so all you need is Cheshire Cat and Sister Bliss to turn up and you’ve got most of Beyond The Tracks’ Friday night programme under one roof. More a ‘second wind’ as opposed to ‘after’ party then… everyone back to Centrala on Friday 15th September? Whatever the moniker it saves Shaun some tidying up. 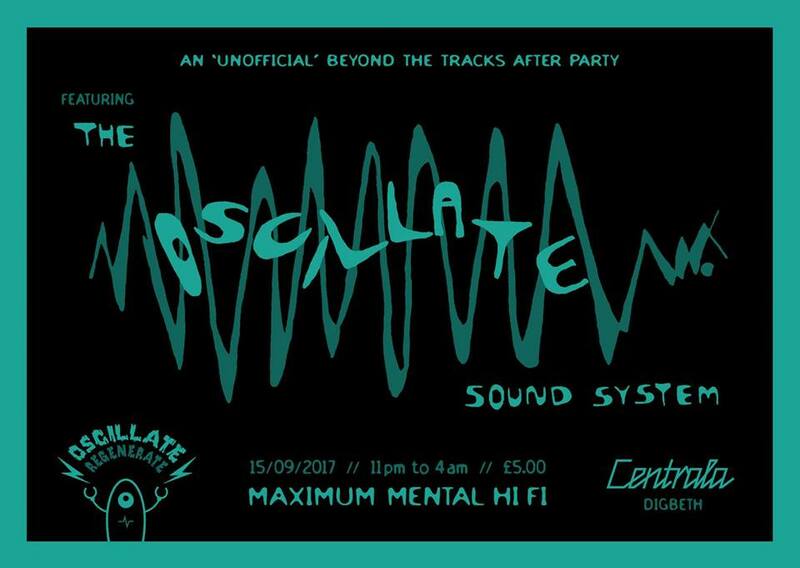 For more on the Oscillate Sound System after party (unofficial) at Centrala on Friday 15th September, click here. To continue the Friday night party directly after the festival’s opening day, Suki10c are hosting an unofficial first night continuance with ‘Way Beyond’, starting at 10pm and going right through to 4am. The event costs £6.00 including BF (booking fee, not boyfriend) on the mighty Skiddle or £8.00 on the door – showcasing sets from Earth is Flat, Bid, Skint Disco and Doktor Jekyll amongst others as yet unnamed. Earth is Flat (or EiF) are two producers whose aim is ‘to make a non-generic style of music; using field recordings, traditional instruments and collaborating with people who share similar values’. They have shared the stage with artists such as Plaid, Kelli Ali, Luke Vibert, Coppe and Fungstorung and have performed in venues such as the Hare & Hounds, mac, and The Rainbow in Birmingham, as well as working down in the Big Smoke. Bid is a DJ who started out in 2012, one who lucky revellers doing both ‘the main event’ and this after party will already have seen performing as part of the Leftfield Leftism 22 Tour. His debut release is due this year on the Download Generation label, showcasing his influential choice in the twisting and manipulation of breaks, beats and sounds. Skint Disco is providing a DJ set in the form of Joe Reid – 28 year old producer from the Midlands, now residing in London. Skint Disco/Joe Reid has received props from major players such as Jam PRD, Wevaman, Hatcha, Funtcase, Kromestar,Seven, Bukez Finezt, Beezy, Enigma Dubz and Dubloadz all regularly throwing down his tracks. DJ slots all over the UK and gigs in Prague, Paris and Amsterdam have resulted in a mini-tour stateside with bookings in Seattle and Denver later in 2017. The evening is supported by Doktah Jekyll, the resident DJ for Digbeth Dining Club and more, lining up a diverse sounding lineup of electronic music to see you through to the wee hours. Even if some of the lineup are people whose stage names defy Google or any other form of research, this sounds like one of those events where those in the know will know to go, and those not in the know probably should be. 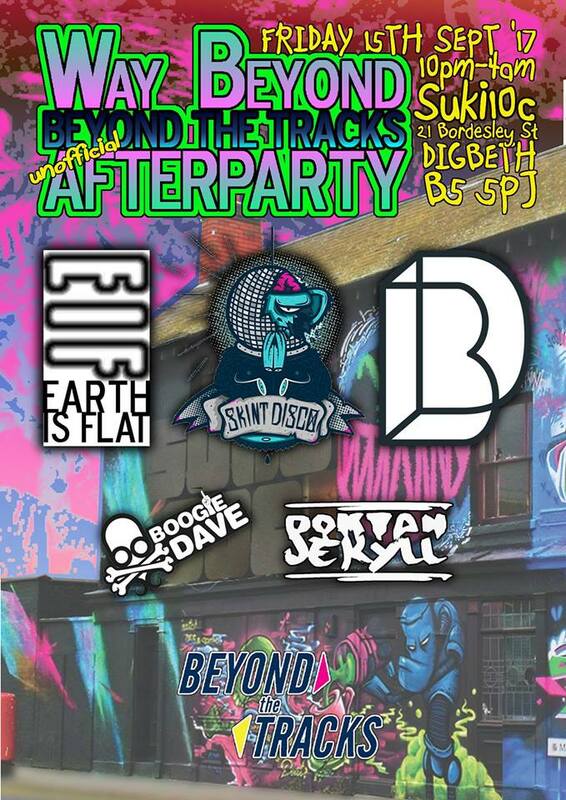 For more on the Way Beyond after party (unofficial) at Suki10c on Friday 15th September, click here. Friday night’s official, ‘Moseley Folk approved’ after party is held at The Rainbow Venues’ Black Box. It will be starting at 11pm and the ‘you don’t have to go home but you can’t stay here’ is at 4am. 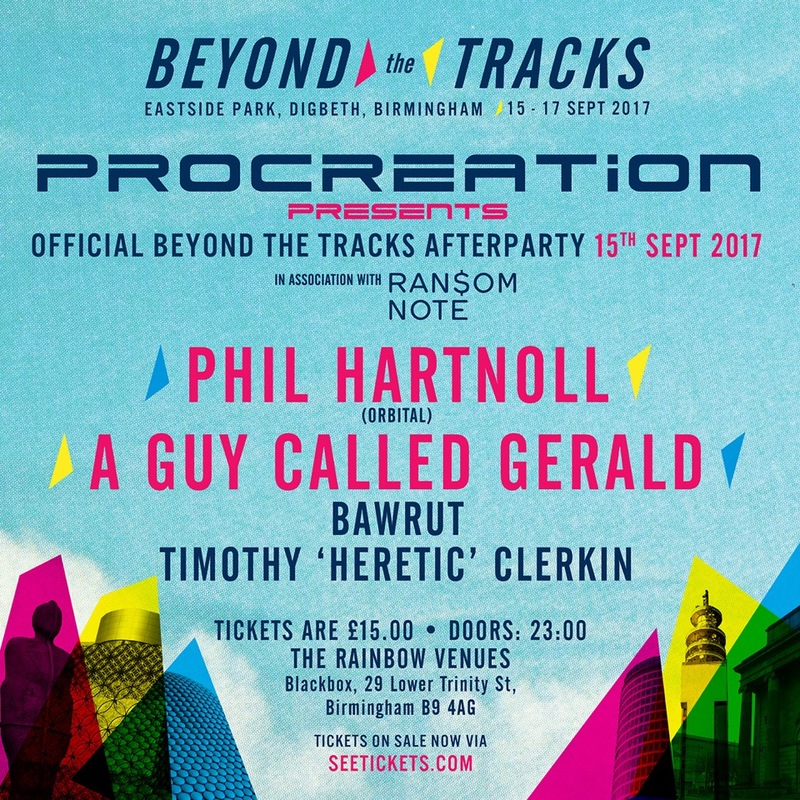 This official after party is brought to us by Procreation – the erstwhile progressive/tech house club night started by Beyond The Tracks promoter, Carl Phillips, back ‘in the day’ – in association with Ransom Note. 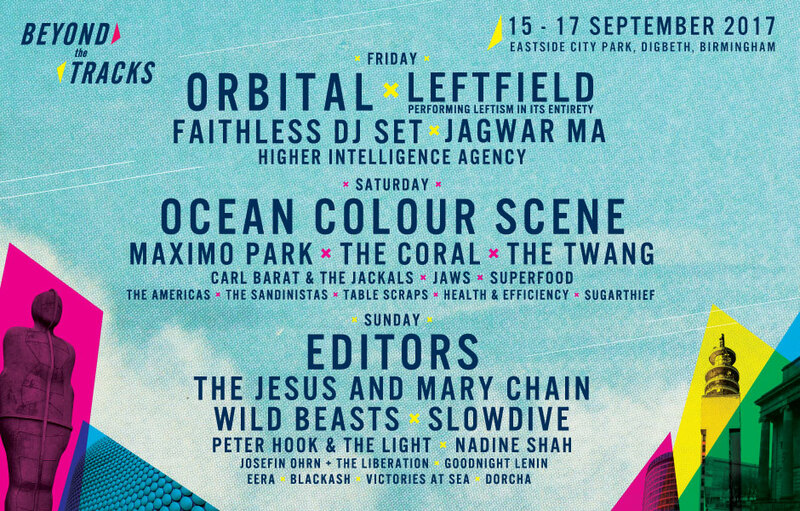 The event will see DJ sets from A Guy Called Gerald, Bawrut and Timothy ‘Heretic’ Clerkin, in addition to Phil Hartnoll (one half of the Beyond The Tracks Friday night main stage headliners, Orbital). Even if you’re not into your dance music, the name Orbital is still bound to ring a faint bell. Okay, that may be because they were named after the London Orbital (or M25 as we would more typically know it) but Orbital (aka brothers Paul and Phil Hartnoll) were renowned for their live improvisation, something of a rarity in the genre. But with five UK Silver records, one UK Gold record, four UK top 20 singles and even making it into the top 10 US Electronic Album Chart twice, it would be safe to say that improvisation or not Orbital’s music has appeal. Perhaps the slightly less prolific of the brothers, Phil Hartnoll, has nevertheless taken his DJ sets to New Zealand, the US and around Europe. And that’s just this year. Now stepping straight from the Beyond The Tracks’ main stage, Phil Hartnoll will be hitting the decks at the Black Box in a rare UK solo show. Joining Phil Hartnoll on the bill will be A Guy Called Gerald – a pioneer of the late 80’s UK Dance music explosion, whose website hails as ‘an iconic name in dance music’. But A Guy Called Gerald arguably kick started Europe’s acid house frenzy releasing the first UK acid house record, the ’88 classic ‘Voodoo Ray’ – following this with the iconic ‘Pacific State’, and laying down the blueprint for early jungle/drum’n’bass. And while not reaching the commercial heights of some of his contemporaries, the consistency and longevity of his releases demonstrate an acclaim that has endured for 30 years now. Kicking it all off in 1987, A Guy Called Gerald had his ’own bedroom studio and was recording 90 minute tapes – probably one a week, so the equivalent of doing an album a week, everything from proto-acid sounds to experimental ambient fields’. And while his releases have slowed down somewhat over that last seven years, I hope that A Guy Called Gerald will bring the same energy of old to this 2017 live set. His 40 live show list for the year would imply that he will. New kid on the block, the Madrid-based Italian Bawrut, will be preceding A Guy Called Gerald on the lineup – bringing his ‘wonderfully balanced line between classics and brand new tracks’. Bawrut’s 2016 release through Ransom Note has been hailed by Mixmag, DJ Mag, Test Pressing, and Data Transmission ‘as one of the freshest releases of 2016’. For more on the official Beyond The Tracks Friday night after party @ The Rainbow- Black Box, click here. The once haven for alternative shenanigans, described by Sam Lambeth as ‘an indie Byker Grove’, Club L’Amour comes back to the venue of its birth for a final, final hurrah on 16th September – giving the Saturday night noise monsters at Beyond The Tracks a comforting place to play until dawn. Well, 5am. Which is dawn enough for us. 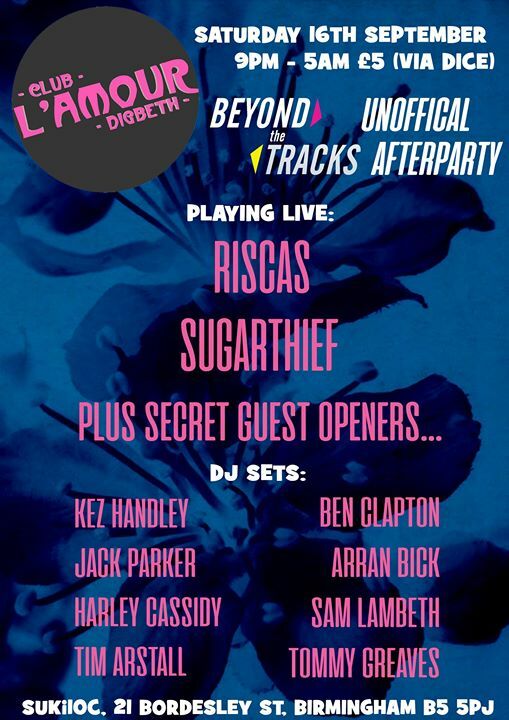 There will be live sets from Riscas and Sugarthief, underpinned by DJ sets from the great, good, and garrulous who adorned the once Digbeth based indie night out. On the line up so far are MP3 jugglers: Kez Handley, Ben Clapton, Jack Parker, Arran Bick, Harley Cassiddy, Sam Lambeth, Tim Arstall, Tommy Greaves – with the ever inspiring ‘secret guests’ to kick it all off. TBC, I guess. But following the fallout of a Saturday night festival line up that boasts Ocean Colour Scene, Maxïmo Park, The Coral, The Twang, Carl Barât and the Jackals, Jaws, Superfood this might be a more than appropriate place to greet the small hours. Plus it’s a reunion, after Club L’Amour packed up its musical powder puff back in February this year. So what are you waiting for..? Oh yeah, there’s that festival thingy up the road to pop into beforehand… phew, and what a before party that’s going to be. For more on the Club L’Amour after party (unofficial) at Suki10c on Friday 15th September, click here. As if all this excitement on the Friday night wasn’t enough, there is another official after party on the Saturday night, post-festival, held at the O2 Institute in Digbeth – running from 11pm through to the wee hours of 3am. Mercifully a little earlier than the Friday night after parties, allowing us a little recovery before the final festival day. Fresh from headlining Saturday night at Beyond The Tracks, Ocean Colour Scene’s Steve Cradock will take to the O2 Institute stage for a DJ set, alongside Paul Smith from Maxïmo Park. But kicking off the evening (morning…. 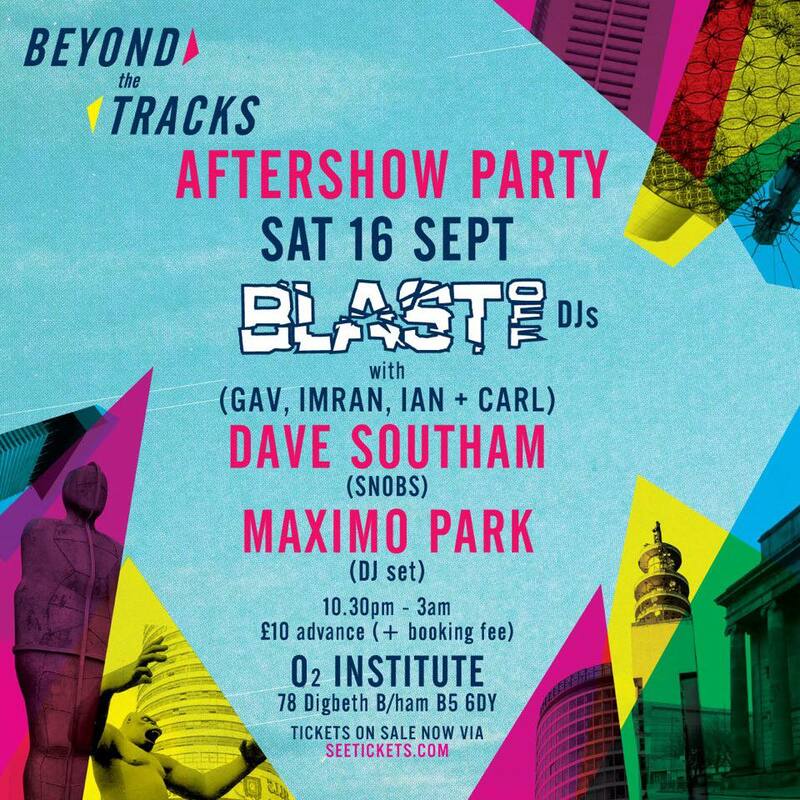 depends when you get there) will be DJs Gav and Imran from Blast Off – a Wolverhampton institution which celebrated 20 years of clubbing in 2016 (despite ostensibly ending the indie club night in 2014, they have returned for numerous ‘one-off’ specials and Christmas/New Year shows. I suppose you can’t keep a good thing down). Next up will be will be Dave Southam, a man made (in)famous as one of the DJs for Snobs, a well known Birmingham nightclub that promotes itself as offering ‘indie, rock’n’roll, alt pop and retro jams’. It is clear then that the theme of this after party is the same as Saturday’s offering at the Beyond The Tracks festival itself: indie and lots of it. Kicking off at 11pm, festival goers will have plenty of time to cover the half-a-mile between Eastside Park and the O2 Institute when Beyond The Tracks finishes at 10:30. Tickets are £10 in advance, plus the usual booking fees. For more on the official Beyond the Tracks Saturday night after party, click here. Beyond The Tracks comes to Eastside Park in Birmingham City Centre, running 15th to 17th September. Tickets for this event are £54.45 for individual day tickets, £145 for a weekend pass.